When I started improving my vision over 10 years ago, all the books and teachers recommended using an eye chart regularly. It gives instant feedback about how well you’re seeing. As you learn healthier ways of using your eyes, like shifting your gaze around the details of a letter instead of staring at it trying to force it to be clearer, you’ll usually see the letters become sharper and blacker. So what’s not to like? Well, I have a history of high myopia (I wore -10 hard contacts from the time I was 16), with visit after visit to the eye doctor, when I often needed stronger lenses. With this background, the eye chart felt like a test I was sure to fail. Why would I subject myself to it voluntarily? When I first steeled myself to look at my eye chart without strong lenses, I needed to stand about a foot in front of it to make out the largest top letter through my foggy blur. Someone with good vision could see this at 200 feet! So for years I continued reducing my prescription and going without glasses as much as I could safely, doing other Bates exercises like palming and the Long Swing, but I avoided the chart. As my high anxiety lessened and my vision slowly improved, the eye chart became the elephant in the living room that I was stepping around. I was driving locally in daylight with my glasses more on top of my head than on my face — it was obvious to me my vision was getting better. I was more relaxed about my seeing, no longer getting a helpless panicky feeling if I dropped something small like a vitamin, sure I’d never be able to find it. I could see pretty well! But yet, if I started doing the eye chart, I’d have to face how much I hadn’t improved, how far I still was from that golden goal of 20/20. I admitted to myself I was avoiding. It’s as if I wanted to be a top runner, and practiced weight training and jumping and stretching, but hardly ever ran! Using the eye chart is looking at details and deciphering them, teaching the eyes and brain to work together. This is exactly the skill I want to improve! 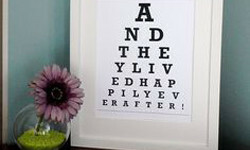 Some part of me knew there was no quick fix or magic machine that would do it for me like the simple eye chart would. Last night I spent almost 2 hours working (playing!) with the eye chart, with a few breaks. Sometimes I had one eye patched and sometimes I used both eyes together. I was listening to EFT (Emotional Freedom Technique) audios, so doing some tapping occasionally. As I’ve noticed before, the tapping seemed to help relax and brighten my vision. The first 3 acupuncture points we tap on are around the eye socket, so this may be helping to free up stuck visual energy there. As always after an evening session of tapping, I slept well and deeply and woke refreshed. My eyes felt great and I could see well. Immediately I questioned this — is my good vision today only because the sun is so bright? Whatever the reason, I’m grateful. During my eye chart practice I am now seeing the slight bouncing of the letters in the Universal Swing almost all the time, and right away. It used to be several minutes before this showed up, if at all, I was so anxious and trying so hard. The Swing feels relaxing to my eyes, similar to a natural sound or image like fluttering leaves or birdsong. So my commitemnt to myself is to spend more time, more often, with the eye chart. I’ve been putting up with “good enough” vision for a few years, and while it’s much better than it ever was, I want more now. I also want to do a better job managing my distance from the chart. I admitted to myself last night that with my weaker eye, it can sometimes be a lot of strain trying to see well from the same distance which is fine for my stronger eye. My weaker-seeing left eye is more sensitive to stress, and its vision can vary wildly. But where it is now is where I start, every time. There is no “should”, only “is”, which can change in a moment. So I have to be present! Anyone who has mastered a skill knows it takes time and dedicated practice. Wishing for something, without action, isn’t usually enough. Vision may not be your challenge, but whatever you want to accomplish, get started, and stick with it. Mastery is its own reward. Previous Previous post: Why Am I Sabotaging Myself?